Posted byLauren Elise Threadgate	 18/09/2016 15 Comments on If Your Legs Weren’t Working, What Would You Do? If you woke up one morning to find your legs didn’t work, would you go out and buy a wheelchair immediately? Or would you seek medical attention? 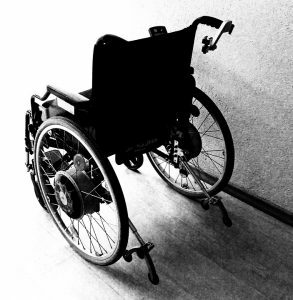 If the first doctor told you there’s nothing you can do and to just go buy a wheelchair, would you listen? Would you expect some exploration into why your legs aren’t working properly before being encouraged to accept your fate of never walking again? Would you seek a second opinion? Would you go find someone who was an expert or specialist? Would you accept the advice of a general practitioner, knowing there are other professionals who dedicate their entire career to legs, the way they work and conditions that affect them? Would you want to see someone with a track record of helping people like you get walking again? We have two legs and physical infrastructure, like nerves and muscles. Our bodies are designed to walk. If your body isn’t working the way it’s been designed to, shouldn’t you expect medical professionals to be concerned about that, rather than simply pointing you towards the most basic way of working around the problem? If your legs weren’t working, would you expect friends and family to be concerned and to encourage you to get you back up on your feet? If they said to you “Walking is hard anyway. Using a wheelchair is much more convenient” how would that make you feel? People might tell you that wheelchairs are more convenient, but that feels like a dirty big lie. They are expensive, and signify an ongoing cost that you wouldn’t otherwise have had. If you want to travel somewhere it will be inconvenient to take a wheelchair with you. Not only that, but an inability to walk exposes you consequential health risks. Wheelchairs are a fantastic invention. Lots of people live wonderful lives without being able to walk. You aren’t against wheelchairs, and you aren’t making assumptions about people who are happy to use them. But you REALLY WANT TO WALK! You don’t want to rely on a wheelchair, you want your body to work the way it should. It’s important to you, and people encouraging you to quit and telling you that you’ll be fine without walking upsets and confuses you. If your breasts aren’t feeding the way they should, you deserve to be treated in the same manner as if any other part of your body was not functioning properly. You deserve support and encouragement. If there is a genuine medical issue preventing your breasts from working properly, then you deserve help to get them working as closely to normal as possible, or at the very least, for someone experienced and knowledgeable to explain why. We need to stop dismissing women with breastfeeding problems by simply encouraging them to quit. We need to stop being untruthful when we say there’s nothing that can be done when there are specialists they can be referred to. We need to stop insulting them by telling them it doesn’t matter how their baby is fed. For the woman who desperately wants to breastfeed, it matters a lot. we also need to work on the barriers that make successful breastfeeding difficult to achieve from the start… the things that separate mothers and babies and less than ideal support in the first weeks. I agree so much Jen! A little help in the early weeks can make make a huge difference in the long run! Imagine how absurd it would be if people insisted you need to use a wheelchair – despite the fact your legs are working perfectly fine – because they used a wheelchair and they’re okay with it. Exactly Rachel! The logic doesn’t apply in any situation except for, apparently, breastfeeding! Interestingly I had the opposite experience. I had so much trouble breastfeeding and the nurses kept pushing me and pushing me even though I was in agony and couldn’t get it to work. While after a month of supreme suffering and one privately hired nursing specialist I did get there in the end and breastfed my baby for 13 months, I’d actually appreciate more support for women with newborns in general to make a decision that’s right for them, whether that means help breastfeeding or help with other options to make their lives more manageable and less painful. In this analogy then they kept telling you to “just walk” and refused to give you a wheelchair or to look at the reasons your legs weren’t able to walk. I agree. If a mum doesn’t want to breastfeed, she should be supported with instructions on how to prepare formula, and informed of any risks involved. The point is that the individual mother’s feelings should be respected and her goals should be supported. I am so lucky that I have had two really positive breast feeding experiences and am willing and able to give it another go in a matter of days with baby number three. I am often surprised at how many people just want to ‘put the baby on formula’. My second was exclusively breast fed for over 10 months because he just didn’t want solids. When I went to see the MACH nurse for some other feeding strategies – all she said was ‘pop him on formula’…and I was like ‘umm, I’m happy still breast feeding if that’s what he wants’. Breast fed until 18 months. No formula. Why the push? Support through the breastfeeding journey is an absolute MUST. I wouldn’t have been able to continue were it not for the resources and people around me that kept me going, especially when it was so difficult. Great insight here… I wish all new mums had people around them who understood and accepted that making baby food is NOT easy and there’s no one-size-fits-all solution when the going gets tough! This is important not only for the mother and baby from a breastfeeding perspective but also for the mother’s overall health. If you suspect something is wrong and you’ve ruled out secondary management issues such as tongue tie etc, then ask your doctor to investigate common causes of primary under- and oversupply – ie, PCOS, prolactinoma, insulin resistance and so on. At minimum the blood test should include prolactin, progesterone, thyroid panel, iron and blood sugar (ideally the full 2-hour glucose oral challenge). It’s cheap and easy to check these but most doctors don’t know to test for these things because they usually have extremely limited training in the physiological causes of low supply. I love this analogy! It makes perfect sense.